We’ve selected what we feel are the key examples of Toronto Building Designs. We have 3 pages of Toronto Architecture selections with links to many individual project pages. One of the largest performing arts companies in Canada is set to open a ‘cultural hub’ and 500-seat theatre in Cambridge, Ontario. Drayton Entertainment inaugurates its seventh and largest venue, Dunfield Theatre tonight. The facility consolidates the company’s operations under one roof and revitalizes the riverfront district of this historic city. A void cannot exist without a mass, and the multipurpose art gallery designed by atelier rzlbd is an expression of this realization and a representative of its design philosophy. Located in a shopping mall the gallery explores the challenges of integrating shopping experience with public and private events that promote contemporary art and architecture. This building has re-opened following a two-year renovation and expansion designed by Diamond Schmitt Architects. 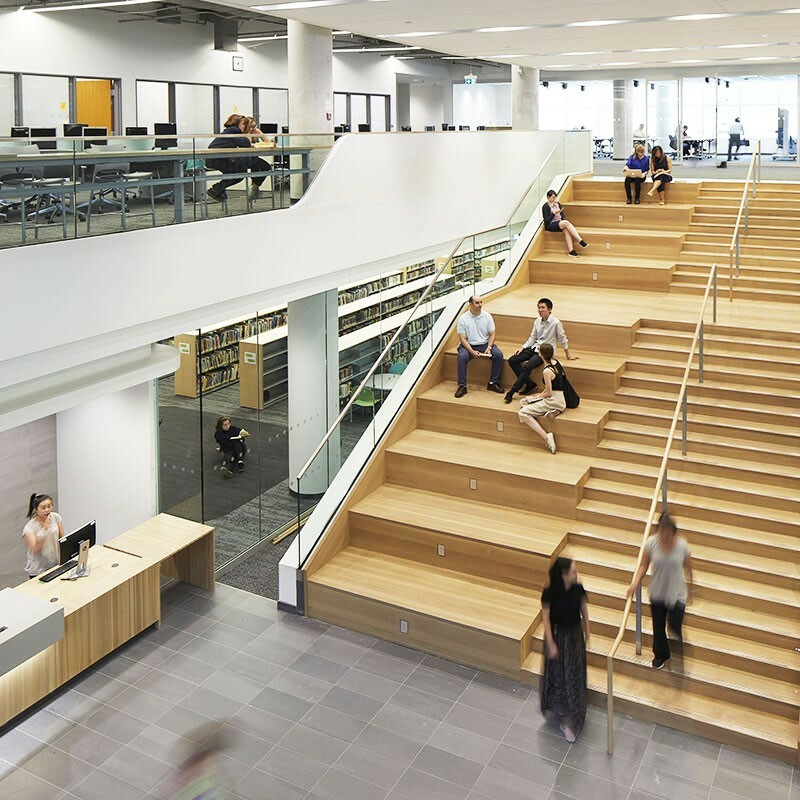 The updated library adds 30 percent more public service, collection and staff space configured on a tight site in the suburb of Etobicoke. The form of the original (1955) two-storey east wing is maintained and connects with a three-storey addition by a double-height Reading Room that houses the library’s main book collection and seating areas. Natural lighting is abundant throughout the library and all occupied spaces have windows and outdoor views. This Toronto house is a contemporary residential structure that adapts an institutional / commercial typology in that all of the spaces have been aligned and arranged along a galleria. One can imagine that all of the served and servant areas of the house have been plugged in to this empty spine. They then have been stretched out to the north and south where they gain exposures, views and natural light. The particular political and economic context of this project introduced a number of challenges. Our client secured a last minute, long term lease of a large, generic two storey commercial space, but was able to negotiate the change of use and appendage of what would have been the parking garage underneath as additional retail space. With its carefully scaled massing and richly patterned cladding of spandrel and clear glass, the Durham Consolidated Courthouse makes a significant contribution to the civic architecture of the emerging urban framework of downtown Oshawa. Its bold, modern vocabulary emphasizes transparency and openness, both for users and passers-by. A large outdoor public space, Courthouse Square, acts as the forecourt to the building entrance and creates opportunities for civic engagement. The larger challenge of this project is not only to construct a great High Performance Sport Centre and a vibrant Student Commons but also to contribute to the coherent development of the campus as a whole. The new building needs to foster a rich set of relationships with its context, acting as a kind of glue than binds program to site. February 10, 2013 in Toronto.